I'm finding Bug to be quite interesting. I began by putting together a little 3 hex per side board and using Othello stones. I like being able to simply flip the stone you just ate in order to grow. It also means you need fewer stones to make a set (17 or 18 for a 19 hex 3/side board), I have yet to have a game that didn't end with at least 2 hexes empty. 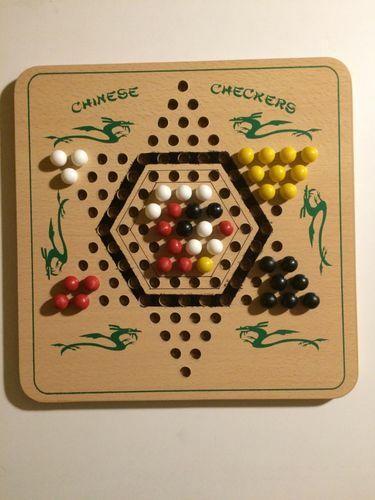 Then I started wondering about a multiplayer variant, That's when the Idea of playing on a Chinese Checkers board came to me. I slightly modified a board I picked up for $2 at a thrift store, by blacking out the row in front of the "home" triangles. I also outlined the next row in (the expanded Bug board), that left the "standard" 3/side Bug board in the center. In the image above, It's red's turn, but red can't place, so the game ends. Normally this would be a win for red. But in a multiplayer game it is possible for the player that ends the game (unable to place) to have very few (or even no) stones on the board. So I think the more natural win condition would be, the player with the most stones on the board when the game ends. In this case that would be white. The easiest way to determine the winner is actually the player with the fewest stones in their home. If a player is able, at anytime, to place all ten of their stone on the board, it's an automatic win for that player. I'm interested to hear what others think of this idea.